It’s 6 p.m. at the Coachella Valley Music Festival. The harshest sunshine of the day has passed, and the crowds, which trickled in earlier in the afternoon, are either staking out their spots for the evening’s biggest bands or waiting in lengthy queues to buy dinner from one of the concession stands. 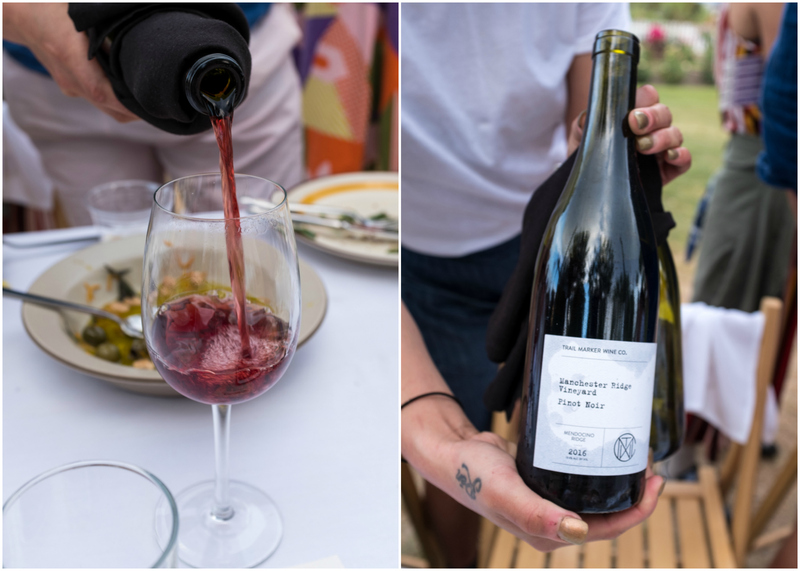 But tucked away on a far edge the venue, removed from the cacophony of the rest of the festival, a group of 200 people is gathering for a quiet dinner party amid a lush rose garden in full bloom. While it may be a desert, the Coachella Valley is farm country nonetheless. Citrus, dates, and vegetables ripen in the region’s 360 days of annual sunshine. 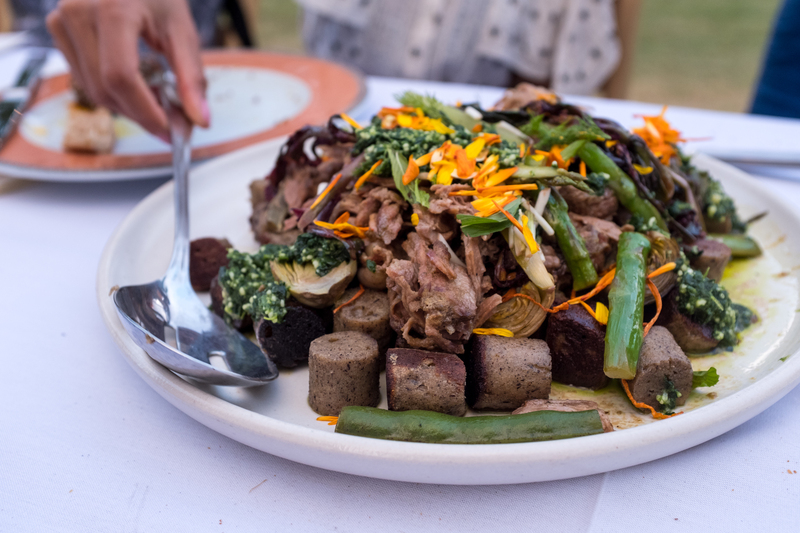 And, for one meal each night, Outstanding in the Field brings those farms—and the farmers themselves—inside the festival. 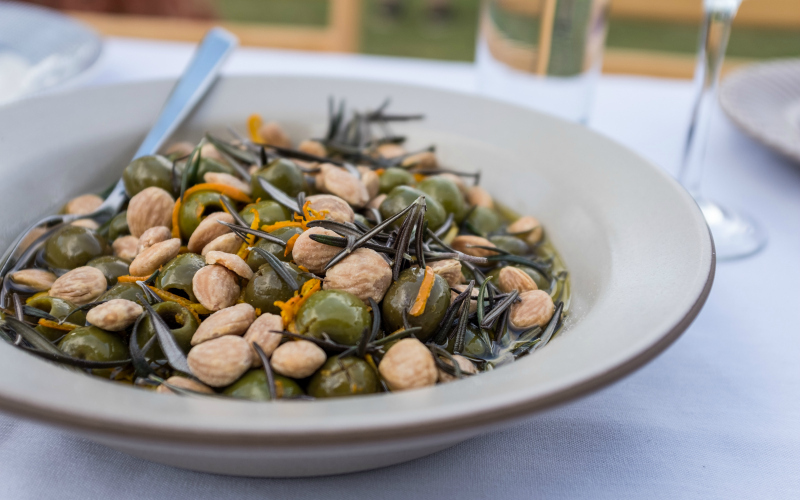 Founded by artist and sustainable-food activist Jim Denevan in 1999, Outstanding in the Field hosts traveling pop-up dinners in outdoor locations around the world, highlighting the work of local chefs, growers, and wine-makers wherever they go. At Coachella, that means inviting in farmers like Christina Kelso of Flying Disc Ranch, who biked under 10 miles from her farm to the festival’s gates with pounds of dates in tow. 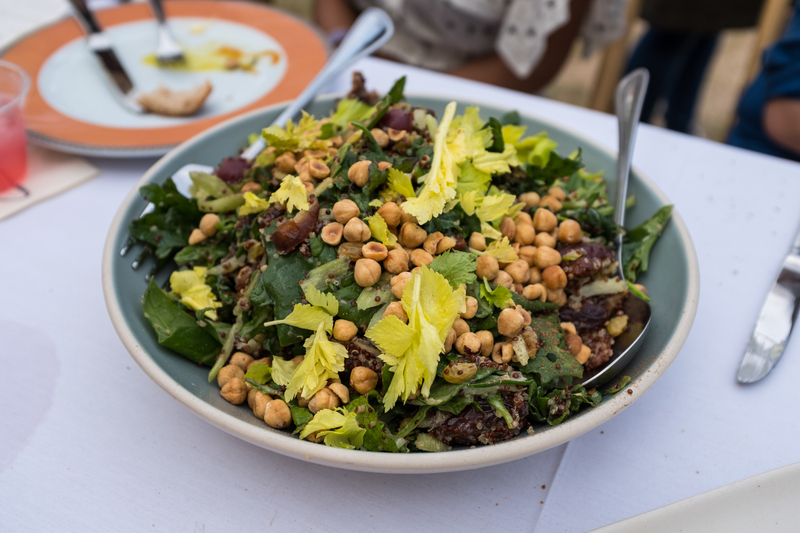 On Sunday night, those dates were tossed into a salad with quinoa, roasted grapes, riesling-soaked raisins, ras el hanout, and kale grown at Coleman Family Farm, a fixture of the L.A. farmer’s market scene, under the direction of the night’s guest chefs, Kyle Johnson of Bourbon Steak in Glendale and Joshua Smith of Bardot Brasserie in Las Vegas. Each night’s meal is helmed by a different pair or team of chefs, often from Los Angeles, preparing dishes that don’t show up on their restaurants’ typical menus. 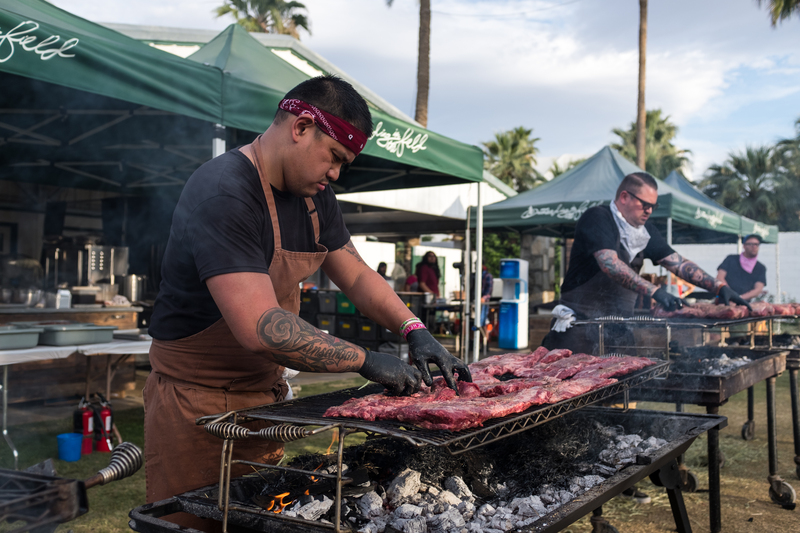 In addition to Johnson and Smith, weekend one saw dinners by Bruce Kalman (Union) and Tyler Anderson (Millwright’s in Simsbury, Connecticut), and Brooke Williamson (Playa Provisions, the Tripel, Hudson House) and Shirley Chung (Twenty Eight in Newport Beach). Next weekend, guests will enjoy fare from Christian Page (Cassell’s Hamburgers) and Oso Campos (Tacos Kokopelli in Tijuana), Pawan, Nakul, and Arjun Mahendro (Badmaash), and Sara Kramer and Sarah Hymanson (Kismet). The experience starts when guests check in at a discrete tent outside walled-off VIP zone past the Mojave stage. 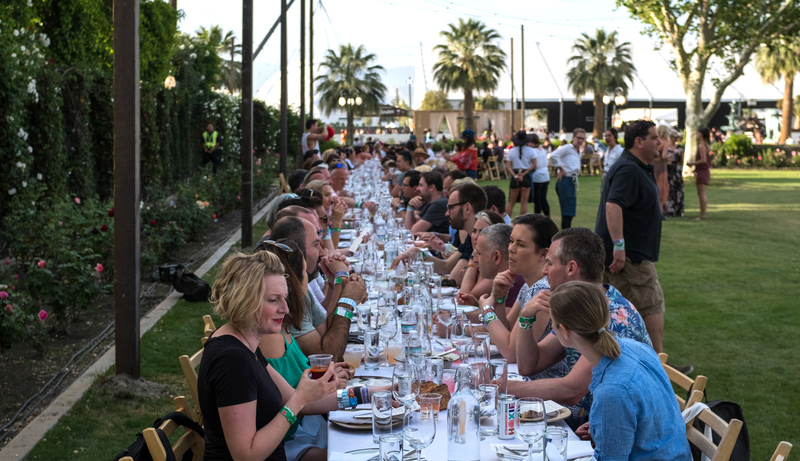 Diners who purchased the $225 upgrade to their festival passes are guided through an archway to find a long table spread with white table linens and actual glasses for wine and water—the only glassware allowed on the premises during the festival. Last weekend, those glasses were filled with lovely wines from Trail Marker Wine Co., the passion project of two former Angelenos who left the entertainment industry life to move to Northern California to pursue their dream of crafting responsibly farmed, sustainably produced wine, and who were in attendance at the meal to talk about their craft. And, of course, there are chairs, which seems inconsequential until you’ve eaten three days of meals while standing or perching on a splintery bench shared with sweaty strangers. Wine by Trail Marker Wine Co.
For nearly two hours, family-style plates of delicious foods are served and shared while the strains of nearby music are just audible but never overwhelm the conversation, as guests discuss which performances they’ve loved and how far they’ve traveled to attend the festival. By the time dessert arrives, the sky has gotten dark, and it’s time to rejoin the crowd in plenty of time to catch the headline acts.